Did you know that in 2013, an average of 3 new phones were launched every day! According to a detailed Mobile Phone Landscape report released by 91mobiles, 957 new mobile handsets were launched in 2013 by 68 brands. Even more interesting is the fact that out of those 68 brands, 48 were homegrown brands that accounted for 68 percent of all mobile phone sales. In the previous year (2012), the number was at 515 and 60% of all sales came from local brands. In 2013, international brands accounted for only 32 percent of mobile phone sales. What Kind of Phones Did Indians Buy? The sub-5k category accounted for 51 percent of all mobile handset sales. However, the affordable phones category (Rs.5k to Rs.15k) saw significant growth compared to previous year. In 2012, affordable phones accounted for only 21%, while in 2013 the same number grew to 38%. Mid Range category saw marginal growth from 5% to 6% and while High range category remained at 5%. It is quite clear from the graphic above that basic and feature phones market is shrinking rapidly, especially because smartphones have now become available for as low as Rs. 5000. The affordable phones category (Rs. 5k to Rs. 15k) also saw maximum number of launches with 212 new launches. Surprisingly, basic phones (below Rs. 2k) saw second highest numbers with 207 new phone launches in that category. The key brands that launched phones in 2013 were Samsung, Micromax, Nokia and Sony. 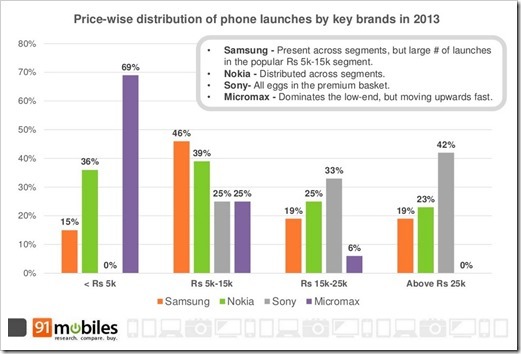 While Micromax led the numbers in under 5k category, Sony dominated the above Rs. 15k and above 25k category. 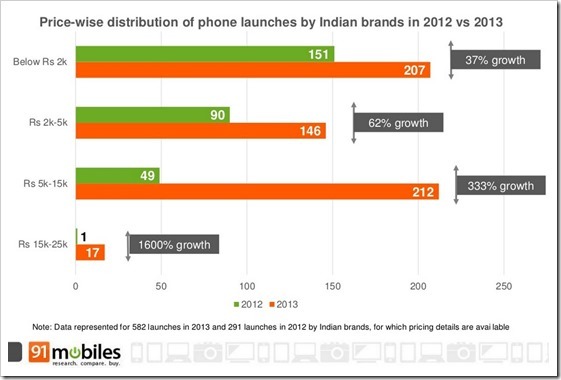 However, when it came to number of new handsets launched, Indian vendors topped the chart. 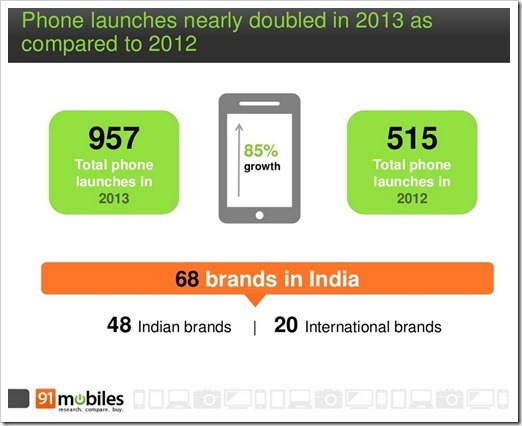 But that was also because most of Indian vendors launched many phones in basic and feature phones category. 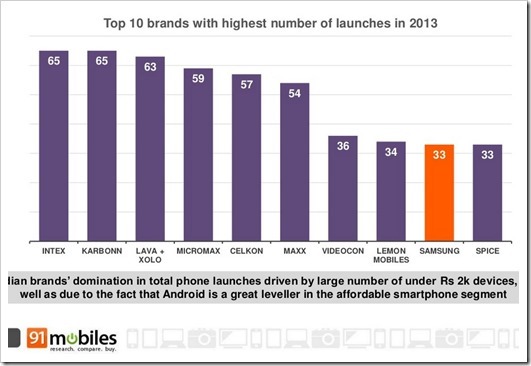 Intex and Karbonn led the chart with 65 new phone launches followed by Lava & Xolo who launched 63 mobile phones each. Micromax launched 59. In comparison, Samsung saw only 33 new phones. However out of those 33 new phones 12 were in the over Rs. 15k category highest of all the brands. 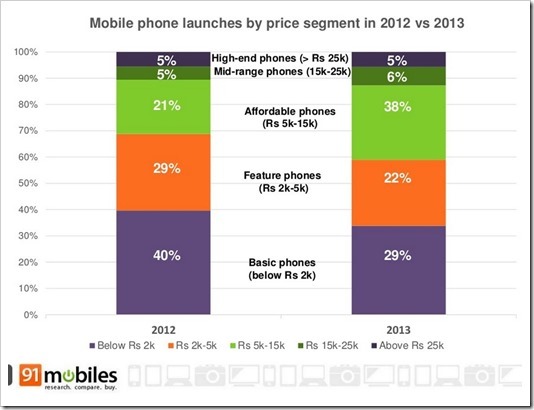 The 91mobiles report has many more comprehensive insights on how Indian mobile phone handset market performed in 2013. Bes sure to check their Slideshare presentation of the report.